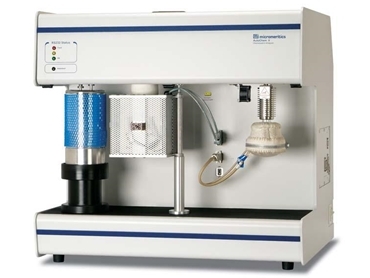 Micromeritics’ AutoChem II 2920 Chemisorption Analyzer, available from Particle & Surface Sciences is a fully automated instrument capable of conducting a comprehensive array of highly precise chemical adsorption and temperature-programmed reaction studies. This laboratory equipment enables the researcher to obtain valuable information about the physical properties of catalysts, catalyst support and a variety of other materials. Researchers can investigate active metal surface area, surface acidity, distribution and strength of active sites as well as BET surface area among others. The AutoChem II Chemisorption Analyzer performs pulse chemisorption, temperature-programmed reduction (TPR), desorption (TPD), oxidation (TPO) and reaction analyses. Multiple experiments can be run using the same sample. Clamshell furnace can heat the quartz sample reactor to 1100°C. The KwikCool feature cools the furnace temperature rapidly down to near ambient, reducing analysis time and increasing throughput. Four gas inlets each for the preparation, carrier and loop gases permit four-gas sequential experiments. Mass spectrometer port and software integration allows simultaneous detection on both the thermal conductivity detector and mass spectrometer. Optional Vapour Generator permits analysis using vaporised liquids in an inert carrier stream. Optimum design and efficient utilisation of catalysts require a thorough understanding of the surface structure and surface chemistry of the catalytic material. Chemical adsorption (chemisorption) analyses can provide much of the information needed to evaluate catalyst materials in the design and production phases as well as after a period of use. The chemical adsorption isotherm reveals information about the active surface of a material and has been employed for many years as a standard analytical tool for the evaluation of catalysts. Additionally, temperature-programmed reaction techniques have emerged as an indispensable tool in chemisorption isotherm analyses in many areas of industry and research.